U.S. director’s staging of Purcell’s ‘The Indian Queen’ dominates annual ceremony in Moscow. Renowned U.S. director Peter Sellars walked off with the award for best director in the opera category at this year’s Golden Mask awards as his production of Purcell’s The Indian Queen at the Perm Opera and Ballet Theater bagged four awards. 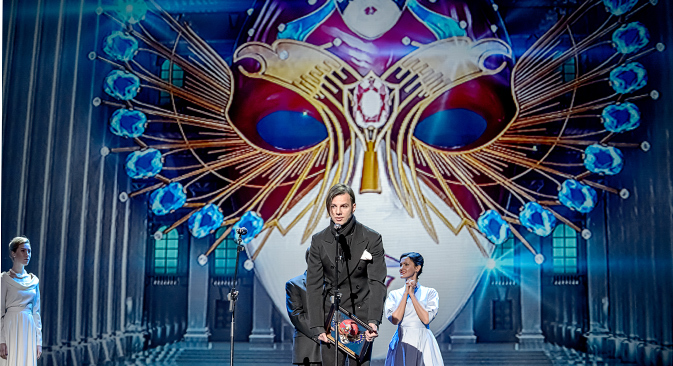 The annual theater award ceremony in Moscow, held on April 18, also saw The Indian Queen take away prizes for the best production, the best conductor (Teodor Kurentzis) and the best female lead (Nadezhda Kucher). Meanwhile, this year’s Golden Mask theater award for the best drama production went to Lev Dodin’s staging of Chekhov’s The Cherry Orchard, which premiered at the Maly Drama Theater in St. Petersburg. The best director award went to Yury Butusov for his production of Chekhov’s Three Sisters at the Lensoviet Theater, also in St. Petersburg. The award for the best male lead in an opera went to bass Dmitry Beloselsky for the role of Philippe II in the Bolshoi Theater’s production of Verdi’s Don Carlos. Beloselsky enjoys an international reputation thanks to the Bolshoi’s tours abroad as well as to his appearances as Zaccaria in Nabucco at La Scala and Oroveso in Norma at the Washington National Opera. The Golden Mask for the best ballet went to The Taming of the Shrew at the Bolshoi Theater created by the artistic director of Les Ballets de Monte Carlo, Jean-Christophe Maillot. The two leads in this ballet, Yekaterina Krysanova (Katherina) and Vladislav Lantratov (Petruchio) were awarded with Golden Masks too. The Golden Mask for Innovation went to Pyotr and Fevroniya Muromskiye at the Praktika Theater in Moscow. Tartuffe of the Berlin-based Schaubühne Theater was voted by theater critics and journalists as the best foreign production presented in Russia in 2014. Meanwhile, Golden Masks for contribution to theater art went, among others, to legendary ballet dancer Maya Plisetskaya and German director Peter Stein. The Russian national theater award Golden Mask was founded in 1993 by the Theater Union of the Russian Federation and is given to the best productions of the season in all theatrical genres. The 2015 Golden Mask jury was co-chaired by the president of the Moscow Art Theater Studio, Prof. Anatoly Smelyansky, and Russo-Latvian actor and director, Commander of the Legion d'Honneur Andrejs Zagars. Based on materials from Kommersant and RIA Novosti.